The network, Internet in specific, is a very complex web that does not always work well. The connectivity between networks, different routers with balancing capability, dynamic routing protocols and many other items play an important role in the speed among two nodes. Depending on network conditions, a client may have lower speed when connecting to national servers than foreign ones; this scenario is very common in big countries (Canada, United States and Russia are some examples). The Low Latency PowerDNS Add-on allows you to forward your users to your fastest server in a cluster. Software's aim is to satisfy real-time sensible services, like Video and Audio; the best example is the VoIP. When a user connects to a server, the first step is to resolve server name. The DNS, with PowerDNS and the Low Latency Add-on (already installed), obtains from database which server has the lowest latency for the current user's network. The DNS sends IP which has presented the better performance of the last 4 hours. Simultaneously, all servers within the cluster (those servers must have installed the Latency Metter) do a passive monitoring and they register the latency times. 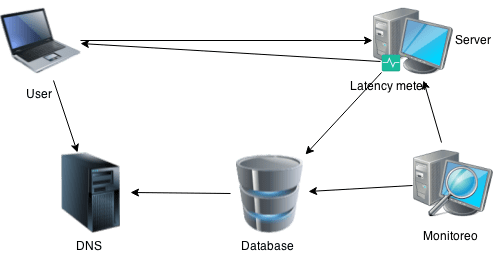 The Server is under an active monitoring, if a Server goes down or its latency time does not satisfy requirements, the monitor will disable that Server in the database. The DNS will exclude that server until the given criteria is met again, and it will be enabled automatically. Elements on Monitoring and DNS server may be installed on the same server. Installation directions are in OKay website. The PowerDNS Low Latency Add-on is licensed under a dual license. The Latency Meter and the Monitoring Event Handler are released under GPL. However, the PowerDNS Low Latency Add-on is released under a commercial license. Please read the licensing schema and contact OKay for any doubt or suggestion.